Aerial view of Ingalls Shipbuilding in 1985. Visible in this photo are (pierside, left to right): USS Yorktown (CG-48), USS Vincennes (CG-49), USS Valley Forge (CG-50) and USS Bunker Hill (CG-52). Under construction on shore are USS Mobile Bay (CG-53) and USS Antietam (CG-54). Ingalls Shipbuilding is a shipyard located in Pascagoula, Mississippi, United States, originally established in 1938, and now part of Huntington Ingalls Industries. It is a leading producer of ships for the United States Navy, and at 12,500 employees, the second largest private employer in Mississippi with WalMart being the largest with 24,000 employees. A view of a section of the Ingalls Shipbuilding Company showing various United States Navy ships under construction. Pictured are (from left to right): USS Boxer (LHD-4), USS Ramage (DDG-61), USS Benfold (DDG-65) and the Israeli guided missile corvette, Hanit (503). In 1938, Ingalls Shipbuilding Corporation was founded by Robert Ingersoll Ingalls, Sr. (1882–1951) of Birmingham, Alabama, on the East Bank of the Pascagoula River in Mississippi. Ingalls was located where the Pascagoula River runs into the Gulf of Mexico. It started out building commercial ships including the USS George Clymer (APA-27), which took part in Liberty Fleet Day 27 September 1941. In the 1950s Ingalls started bidding on Navy work, winning a contract in 1957 to build 12 nuclear-powered attack submarines. Litton Industries acquired Ingalls in 1961, and in 1968 expanded its facilities to the other side of the river. 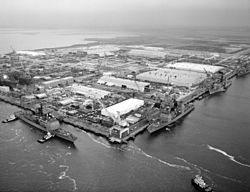 Ingalls reached a high point of employment in 1977, with 27,280 workers. In April 2001, Litton was acquired by the Northrop Grumman Corporation. On 29 August 2005, Ingalls facilities were damaged by Hurricane Katrina; most of the ships in dock and construction escaped serious harm. While shipbuilding was halted for a while due to the destruction of many buildings, most vehicles and the large overhead cranes are the same that the facility continues to operate today. On 31 March 2011, Northrop Grumman spun off its shipbuilding sector (including Ingalls Shipbuilding) into a new corporation, Huntington Ingalls Industries. In 2015, Ingalls Shipbuilding Company signed a contract with US Navy for new destroyers, littoral combat ships, and new landing craft. USS John Finn (DDG-113) was one of the first new destroyers and was launched on March 28. The company is also building the USS Ralph Johnson (DDG-114), USS Paul Ignatius (DDG-117) and USS Delbert D. Black (DDG-119). On 21 March 2015, the new San Antonio-class amphibious transport dock ship USS John P. Murtha (LPD-26) was ceremonially christened. The vessel had been launched on October 30 and was commissioned in 2017. On 27 March 2015, the shipyard received construction contracts for their next destroyers. Ingalls Shipbuilding Company was awarded a $604.3 million contract modification to build the USS Frank E. Petersen Jr. (DDG-121). Ingalls' primary product has been naval ships, and naval projects for Egypt, Israel, and Venezuela. In the 1950s, Ingalls attempted to enter the diesel locomotive market. They cataloged an extensive product line, but only one example, known as the model 4-S, was produced. It was sold to the Gulf, Mobile & Ohio Railroad. Ingalls also manufactured covered hopper railroad cars in the early 1980s, producing around 4,000 units, primarily for the lease market via North American Car. SS Brasil (1957), a luxury liner launched in 1957. SS Argentina (1958), the last luxury ocean liner to be completed in the United States as of 2015. ^ "Flurry of Contracts Spark US Navy Shipbuilding". Retrieved 9 August 2016. ^ "Ingalls Shipbuilding gets $3.1 billion Navy warship contract". Retrieved 22 August 2016. ^ "Ingalls Shipbuilding, Pascagoula MS". Archived from the original on 5 April 2016. Retrieved 22 July 2016. ^ Bayfield and Windsor-class attack transports, per  List as of 3-6-15, may not be exhaustive. Wikimedia Commons has media related to Northrop Grumman Shipbuilding, Pascagoula. This page was last edited on 31 March 2019, at 23:20 (UTC).